· ¼ tsp. Pepper pwd. Wash & peel the carrots & quarter them vertically in uniform pieces. Wash & thread the french beans. Wash & separate cauliflower into florets. Blanch the vegetables in order of time taken for cooking with sugar i.e. carrots, french beans, cauliflower, peas. Drain the vegetables & reserve ¼ cup of the liquid. Refresh the blanched vegetables in cold water & drain. Chop the carrots & french beans finely & the cauliflower in tiny florets. Keep aside. Melt butter in a pan on low heat. Add the flour & mix with the butter. Stir carefully till the rawness of the flour disappears but do not allow the flour to change colour. Take the pan off the heat & keep stirring while gradually adding the milk to it. Make sure it is smooth & not lumpy. Again place the pan on the stove & cook on low heat till the sauce thickens. The sauce should be of pouring consistency. Keep aside. Coat an oven proof glass dish with butter or a little olive oil. Place all mixed vegetables evenly in the baking dish & pour the prepared sauce evenly on the vegetables. 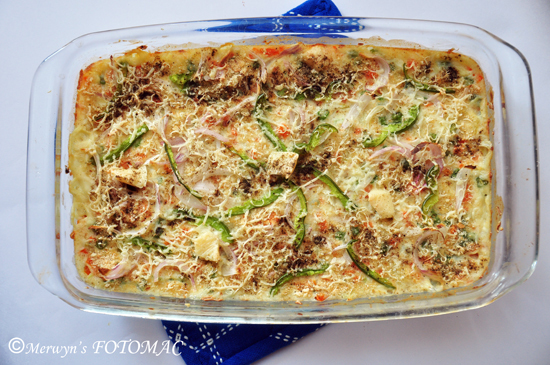 Sprinkle bread crumbs, ¼ cup cheese, sliced onions & capsicum. Sprinkle some pepper pwd. & dot with butter or sprinkle olive oil. Bake in a pre-heated oven at 200C till it bubbles & the top turns a light golden brown about 20 mins.. Serve with toasted garlic bread or enjoy it plain with ketchup.